Fear Effect Sedna marks the return of a series that I never thought that I would see again. After Eidos Interactive cancelled Fear Effect Inferno which had been bound for PlayStation 2, it had remained dormant until 2015, when the Square Enix Collective had presented the chance for developers to pitch game ideas to revive the long-neglected properties that they had accumulated that were gathering little more than dust. With the tail whipping gecko Gex, the futuristic third-person RPG Anachronox, and Fear Effect as the first three choices that were available, it was the pitch from French developer Sushee for the cel-shaded action-adventure series that succeeded. After a successful Kickstarter campaign and the years that have passed since, we can now experience what they have worked tirelessly to create. An immediate decision that was misjudged is not choosing to explain who the central characters are, their motivations, nor recapping what happened in Fear Effect. The game’s listing on the Nintendo eShop even goes as far to refer to Fear Effect Sedna as being “the quintessential sequel for existing fans and a perfect starting point for newcomers,” but, even as someone that played and adored the first game, I had to pore over Wikipedia for reminders. You can learn as you go, of course, but it doesn’t alleviate how disconnected you feel early on. Given that Fear Effect Sedna takes place four years after the first game (and, as far as I am aware, before Fear Effect 2: Retro Helix) this choice is both confounding and risky, seeing as the onus falls on you to work out who’s who and how everyone knows one another. The best recommendation for newcomers, then, may be to wait it out for Fear Effect Reinvented before tackling Fear Effect Sedna, which is a shame seeing as overcoming that particular hurdle leaves you with much to enjoy. On paper, Fear Effect Sedna is positioned as a real-time tactical action game, but I’d argue that label can be a disservice to the many intricacies to be found in its gameplay. Sushee has spoken candidly about wanting to respect the original team’s work while exploring their own vision, and that has been achieved with aplomb. The clearest change has been a shift away from Resident Evil-style controls and environments that switched between fixed camera angles in response to your movements, to exploring those that have been built to be played from an isometric viewpoint. Beyond that, your experience with Fear Effect Sedna can be broken down in three ways: stealth, puzzles, and firefights. This trifecta of approach helps to constantly vary your time with the game, lending nuance over its pacing while making sure that you never become bored doing one aspect over and over again. Stealth sections are the simplest to explain, but, as always, can be the trickiest to overcome. Clicking the Left Stick will let you enter stealth mode, reducing noise and visibility as you sneak past guards or out of sight from ever-watchful security cameras. Creep up behind an enemy undetected and you can snap their neck, although, with each guard on patrol and their gaze presented as a cone, you will want to keep in mind whether they will spot the body or not. Puzzles are also simple to explain in that they are, well… puzzles. These can be exceptionally devious seeing as they often rely on clues that have been left for you to spot in your surrounding environment, and, for the first time in a long while, I turned to scribbling everything down on paper with the hope that it will be needed at some point. It would be bad form to talk about many of these puzzles seeing as they are usually tied to plot points, but, early on, will see you defusing bombs, eavesdropping on conversations while serving champagne to remain discreet, aligning geometric shapes, and working out a server password. Each boggles your mind in different ways, and there’s some genius puzzle design scattered throughout the game. So far so good then, but it’s in combat that Fear Effect Sedna comes unstuck. If stealth isn’t an option (or something that you would prefer not to consider), then you’ll whip your guns out and pop up from cover to rain bullets at your enemies. The problem is that none of this feels as tight as it needs to be, the player being left to select their target with the Right Stick to then fire in their direction with the ZR Button – reloading automatically when your clip is depleted (or you can hit the X Button to reload manually). You can take cover whenever your character is next to an object with the A Button, but the enemy AI never takes such self-preservation seriously enough to do the same. They would rather run to your location to force you out of cover, meaning that the firefights quickly become an irritation. Sushee has tried to throw in some more interesting ideas whether that be unique weapons for each character that have limited ammunition (such as bouncing bullets, a taser, and crossbow bolts), using two of these at the same time to perform a more powerful synergy attack, or the Tactical Pause mode lends some room for strategy – letting you hit the Minus Button in combat situations to freeze time. This will let you give each character under your control orders to carry out, like moving into cover or using special weapons from a particular angle to maximise damage. It’s something that genre purists will be thankful for, even if it won’t prove to be a particularly essential addition for most. And then there’s the Fear Effect mechanic. When your characters are hurt, are surrounded by enemies, or find themselves in stressful situations, their Fear will rise. This impacts their strengths and weaknesses and is something that becomes more meaningful as the game descends into its, admittedly fascinating, exploration of Inuit mythology. In truth though, all you need to know is that the higher your character’s Fear the more damage they will deal but the lower their resistance will be to make them more susceptible to injury. Your Fear can be reduced by using a Medkit, but, seeing as you will be readily using these to restore your health, it’s hard to ever really grasp or notice the impact that the Fear Effect mechanic is actually having. That comes as an understandable disappointment, seeing as it is the game’s namesake. At least Fear Effect Sedna looks the part with its cel-shaded aesthetic, even if the character animations in cutscenes can look unnatural in places. There has been a commendable effort to voice the game’s dialogue, which helps to breathe life into characters such as Hana (Natalie Roers), Rain (Julie Shields), Glas (Spencer Cannon), Deke (Michael Howard Osborne), and Axel (Matthew Curtis). But, the delivery can, unfortunately, be inconsistent and disjointed, and I would even go as far as to say that the script feels dated in stark comparison to the developer’s desire to modernise the rest of the experience. 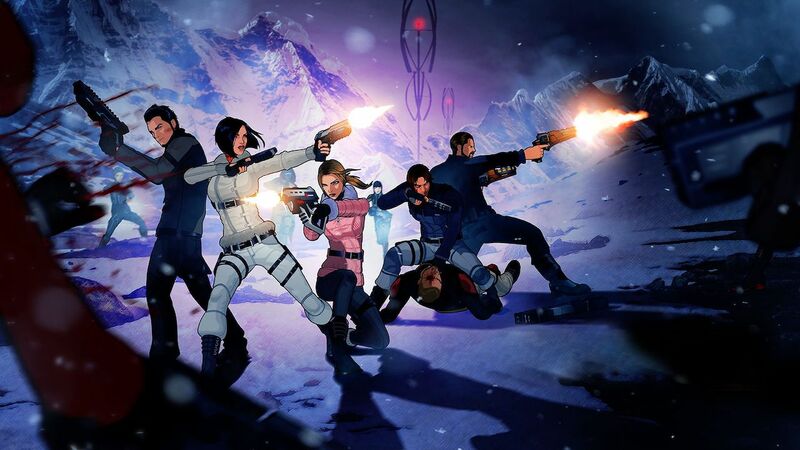 Fear Effect Sedna has suffered from an internal conflict over whether to stay true to the originals or start over. There is an authenticity in approach that lifelong Fear Effect fans will no doubt appreciate, but, taking a step back to look at the game as a whole, even they may come to lament the many flaws that it is riddled with. It’s a shame, therefore, that it can’t outrun its demons.